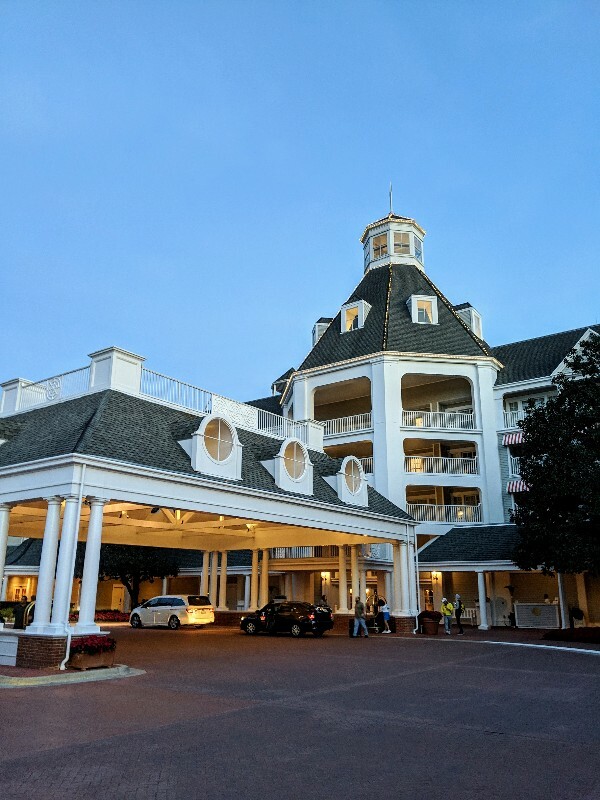 Disney’s Yacht Club is a beautiful deluxe resort at Disney World and is connected to Disney’s Beach Club Resort and Villas. 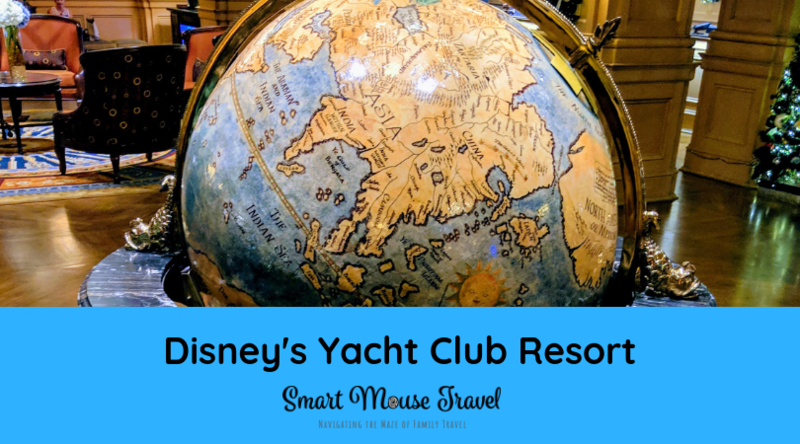 We love the variety of food and entertainment options in this area and decided to try a Disney’s Yacht Club Resort Standard View Room before departing on a Disney Cruise. Disney’s Yacht Club Resort is considered an Epcot area resort. Disney’s Yacht Club is located adjacent to Disney’s Beach Club Resort and is a short walk to Disney’s Boardwalk Inn and Villas. Disney’s Yacht Club Resort has an upscale nautical ambiance. 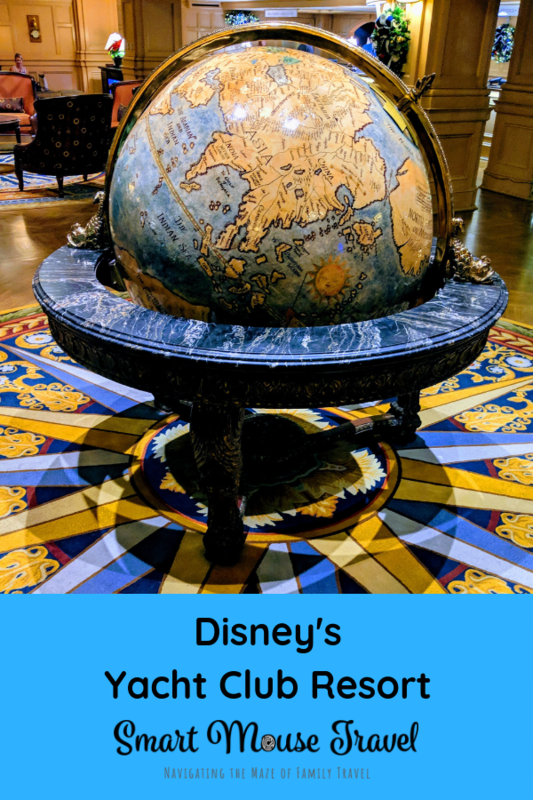 The lobby has a huge globe over a round, compass inspired rug. The lobby has several seating areas where you can relax while enjoying the sophisticated decor. Railings along the second floor of Yacht Club Resort alternate traditional railings and wooden panels with an embossed ship’s wheel. There are also rope swags along the railing. The carpets throughout the resort have ships and compasses to continue the nautical feel as you walk to your room. 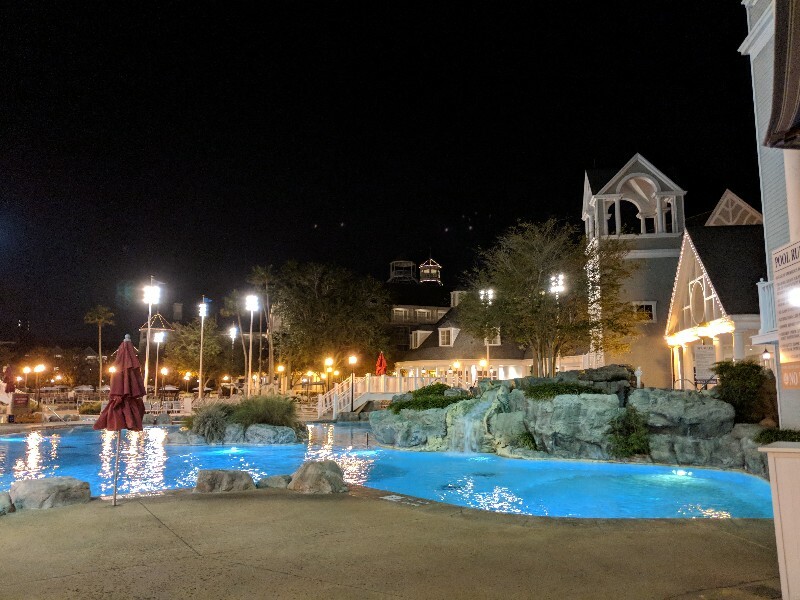 One of the best things about Disney’s Yacht Club Resort is Stormalong Bay which is the resort pool, although pool isn’t really the best description. 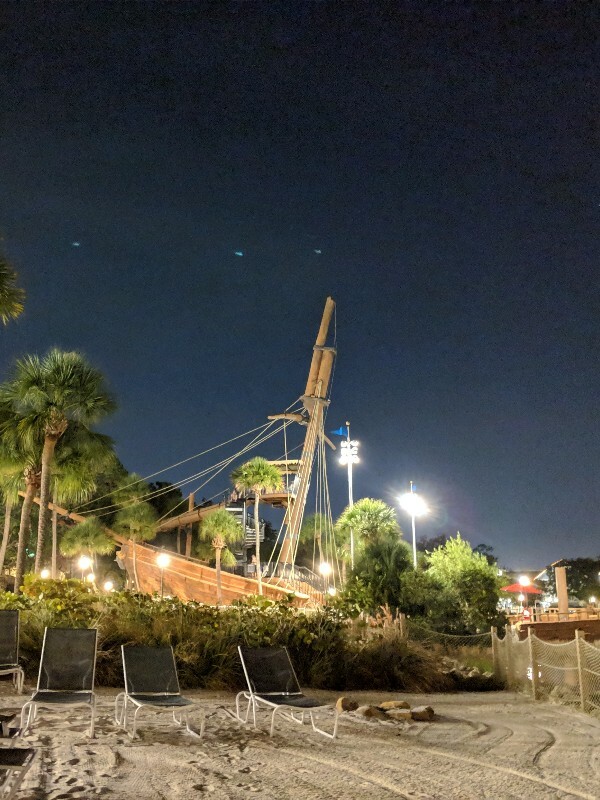 Stormalong Bay is a 3-acre (12000-sq-m) shared water park area for both Disney’s Yacht Club and Disney’s Beach Club resorts and is our favorite pool in all of Disney World. One of the reasons Stormalong Bay is so special is that the pool floor is completely covered in sand. From the shallow areas to the deeper parts of the pool soft sand is there to cushion your feet. Stormalong Bay has one of the highest hotel slides at Disney World, and the slide is an impressive 230 feet (70 m) long. To access the slide you must climb to the top of a huge shipwreck replica before plunging down to the pool below. There is a smaller water slide for younger or less adventurous guests of Disney’s Yacht Club. Another thing that makes Stormalong Bay special is the lazy river that winds around one section of the water park area. Tubes for the lazy river are provided near the river entrances at no charge. If all these features of Stormalong Bay don’t seem like your cup of tea there is also a small leisure pool at Yacht Club located near the tennis courts. There are several dining and lounge options located in Disney’s Yacht and Beach Club complex. I’ll cover a few of our favorites below. Check here for a complete listing of dining options. 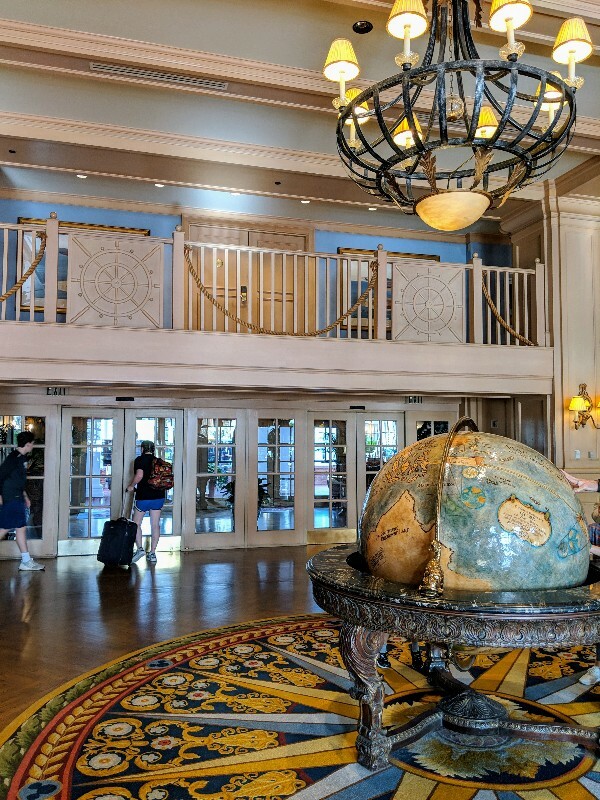 I was worried that this fine dining restaurant at Yacht Club might be a bit stuffy, since it is one of only a handful of Disney World restaurants with a dress code. However, we saw lots of families and many groups without kids enjoying the warm ambiance of Yachtsman Steakhouse for dinner. 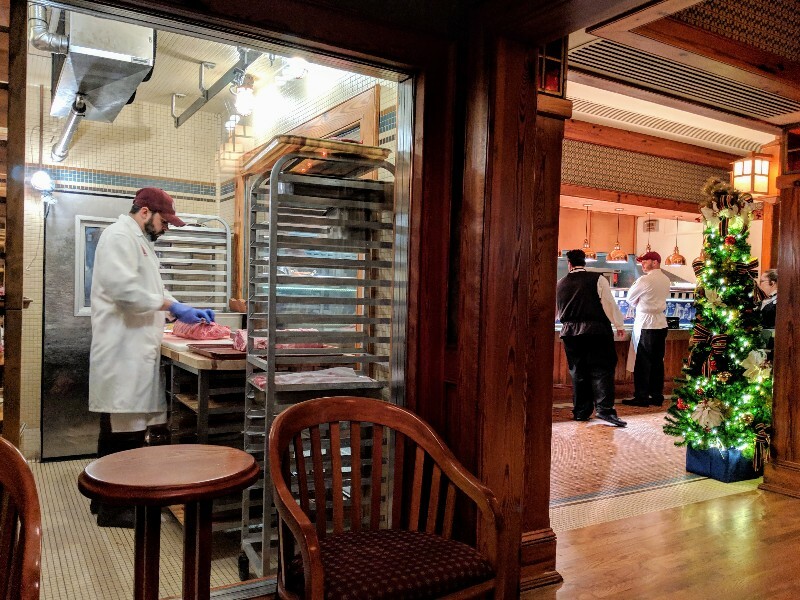 While waiting to be seated we got to watch a butcher hand-trim steaks and some of the chefs working in a partially open kitchen area. This was a great way to get excited about our meal. We decided to split a couple of entrees and a side for our meal. Our server told us that although each entree is paired with a specific potato on the menu those can be switched to suit personal preference. Our family ordered a filet mignon with baked potato, a New York strip steak with potato gratin, and truffle mac and cheese. This ended up being a perfect amount of food for our family of 3 medium eaters. Adding the mac and cheese was a good choice, since Elizabeth loved the steak and ate a large portion of both the filet and strip steaks. I thought the quality of our meal was good, and we liked the atmosphere of Yachtsman Steakhouse. I would definitely go there again if I had time for a nice sit-down dinner. Located just off the main lobby of Beach Club Resort, Cape May Cafe is open for breakfast and dinner daily. Breakfast is a fun character meal featuring Minnie and some friends with a full buffet. Dinner is a buffet with a variety of options, but especially features seafood items. Find out more about the Cape May Cafe character breakfast in our full review. This fun diner is near Stormalong Bay in between Yacht Club and Beach Club. Beaches and Cream serves burgers and sandwiches for lunch and dinner, but for us the ice cream is the main event. In fact, the Kitchen Sink sundae is a popular, crazy concoction that serves four people (or more in my humble opinion). Beaches and Cream is a small restaurant with only a handful of tables, booths, and counter seats. If you plan to eat inside the restaurant you will want to have advanced dining reservations. I’ve occasionally seen wait times over two hours. Keep checking for last-minute reservations. Sometimes you can get lucky and snag a reservation a day or two before you plan to visit. If you don’t have a reservation and only want treats you are in luck! There is a door to the right side of the main entrance that does take-out orders for a handful of items like shakes, ice cream, and floats. 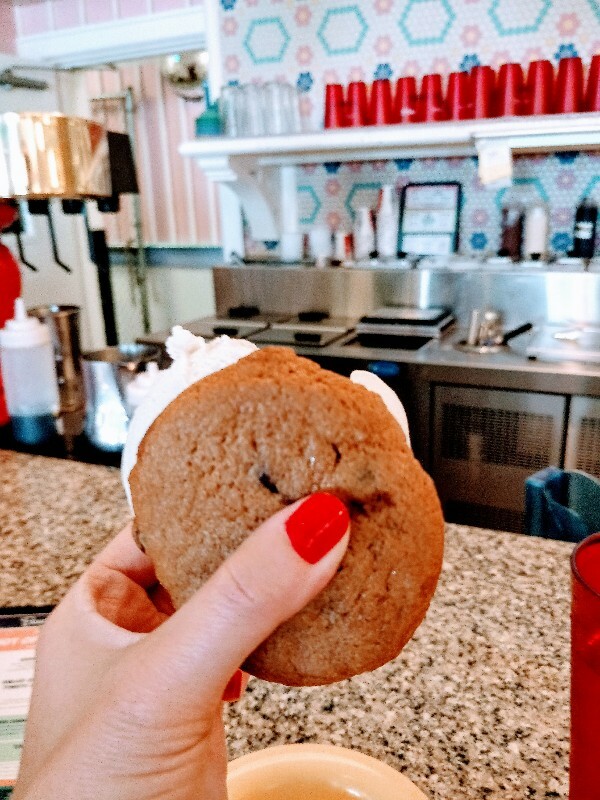 My favorite Beaches and Cream treat is an ice cream sandwich of vanilla ice cream wedged between two huge chocolate chip cookies. I get one of these delicious ice cream sandwiches any time I am near Beaches and Cream. As we entered our Yacht Club Resort Standard View Room I immediately noticed several things to like. 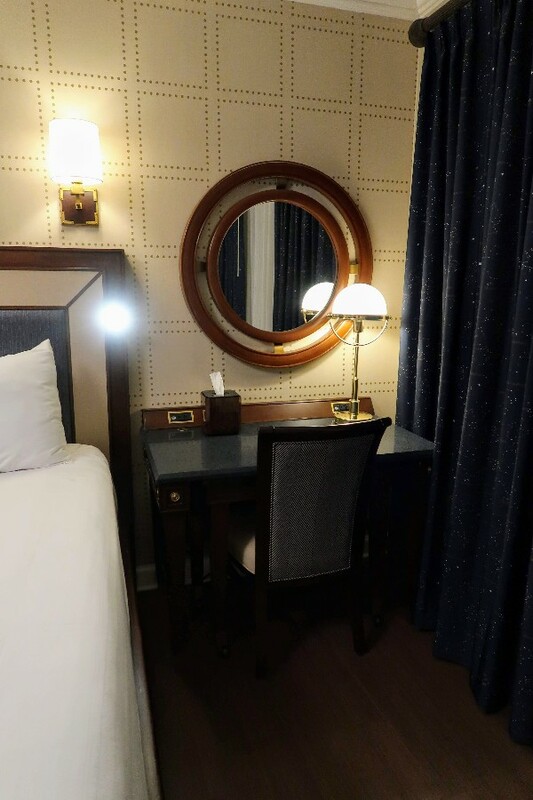 The room felt open and spacious with great little nautical details throughout. I loved that the floors were laminate and our room had the configuration that can sleep up to five with two queen beds and a day bed that turns from a couch to a twin-size bed. 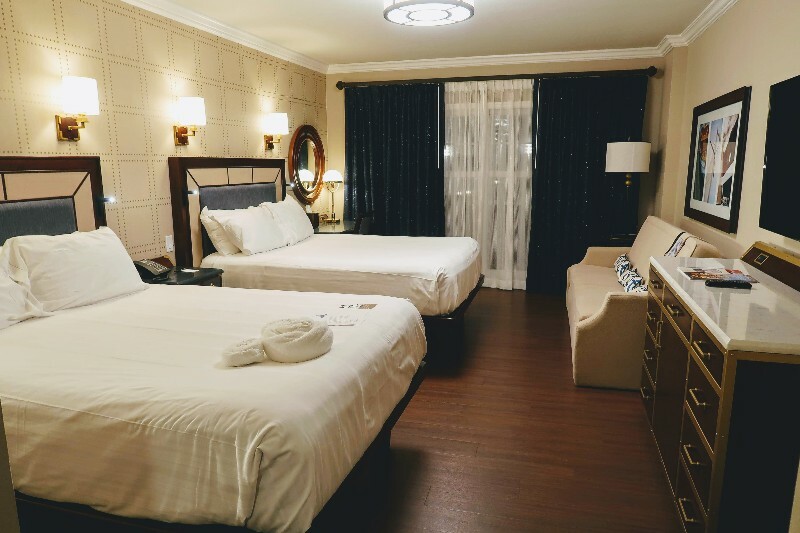 Please note that a Yacht Club Resort Standard View room can have any of the following configurations: 2 Queen Beds and 1 Day Bed or 1 Queen Bed and 1 Twin-Size Sleeper Chair and 1 Day Bed or 1 King Bed or 1 King Bed and 1 Day Bed. 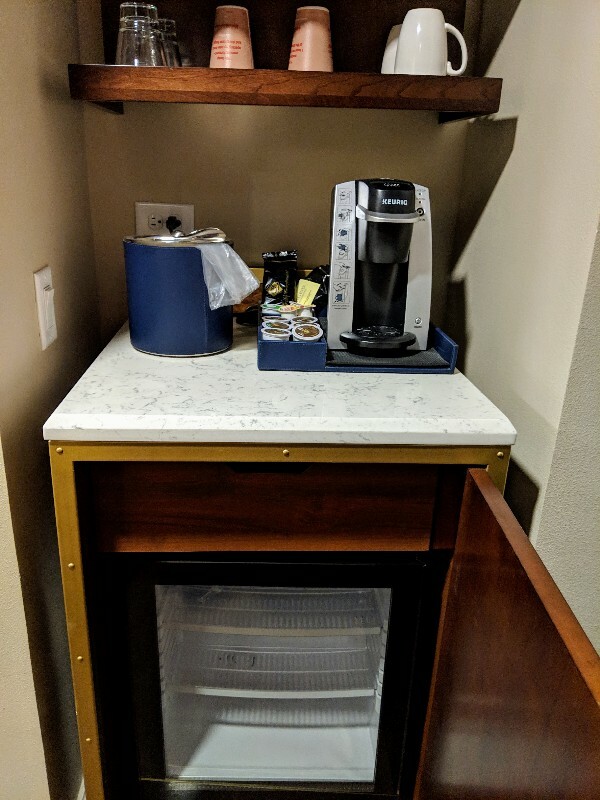 Just inside the entrance to the room there is a small coffee station on top of the trunk that conceals the mini fridge. I like that the deluxe resorts have Keurig coffee pots. The single-cup coffee makers at moderates and value resorts tend to make very weak coffee even if I decrease the water amounts for the pre-packaged grounds. The mini-fridge in our Yacht Club Resort Standard Room seemed smaller than ones we’ve had at other deluxe resorts. A half gallon of milk only fit sideways on the shelf and bottled waters were also a tight fit. For our short stay it wasn’t a problem, but if it was a longer stay with more groceries I may have had trouble fitting items in the fridge. 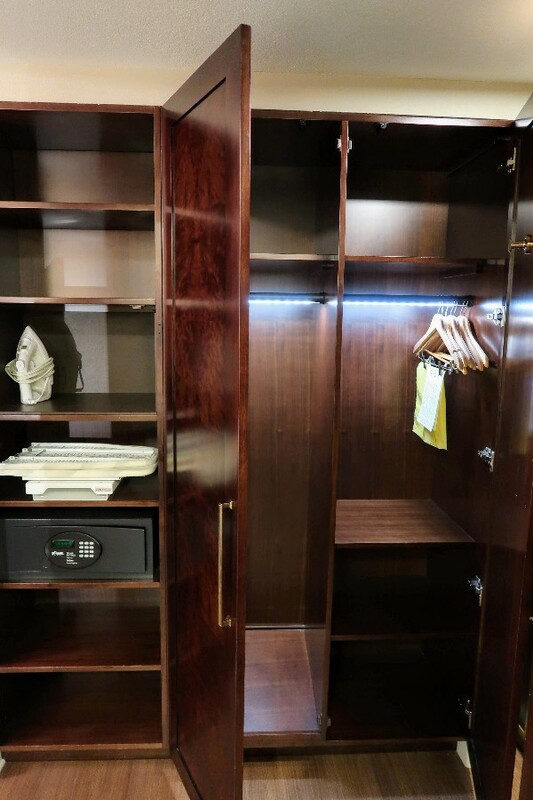 There is a huge wooden closet in the entryway with an in-room safe, several shelves, a full length mirror, and areas for hanging long and short items. An iron and foldable ironing board are also located on one of the closet shelves. From the entryway you can see the entire bedroom area. The bedroom decor is a mix of dark wood with cream, navy, and brass accents. If you need more storage space than the closet provides, there is a large dresser in the room just below the wall mounted television. This dresser also has several electrical outlets. Our room had 2 Queen Beds and 1 Day Bed which means it could sleep five people. The couch/day bed is a great way to have seating during the day plus additional sleeping space at night. The beds have a bedside table between them. 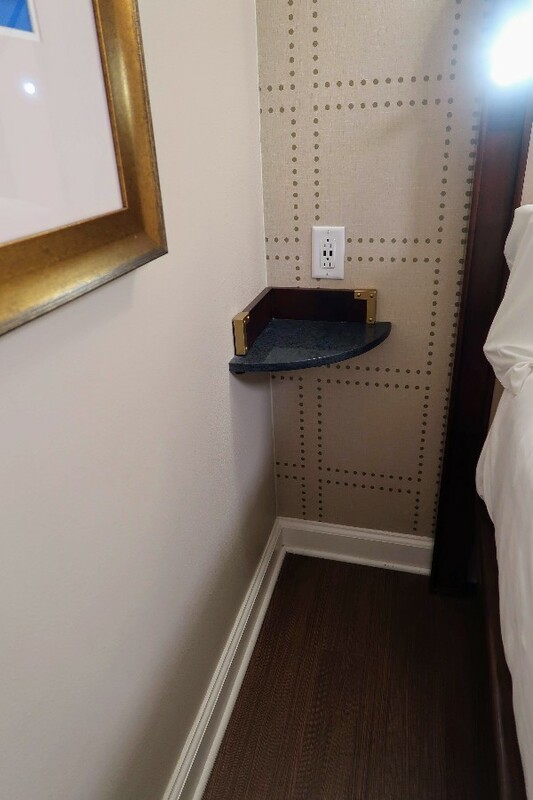 On the other side of the bed where normally there is nothing the standard room at Yacht Club had a little shelf with outlet. This was a perfect spot for someone to charge a phone overnight and still use it as an alarm. The room has a desk and chair. The desk is actually two different pieces: the normal desk and then hidden underneath is a rolling table. This gives extra table space in case you want to eat in the room, write, or draw. 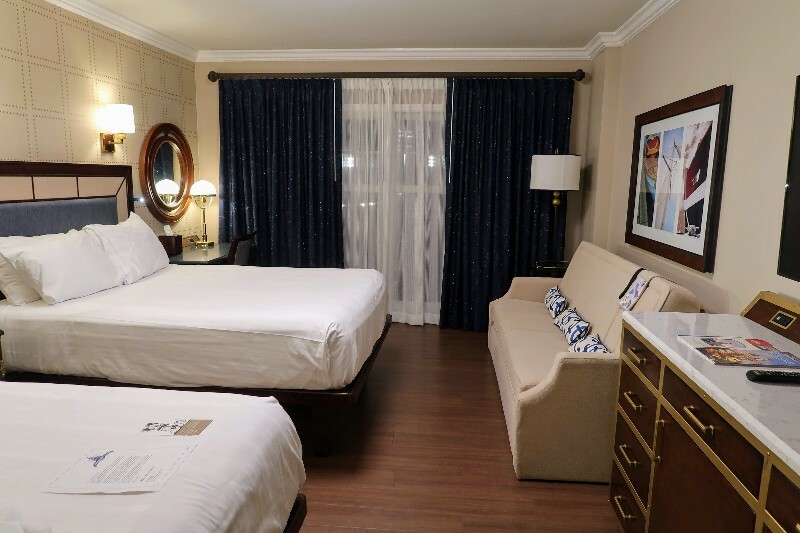 The Yacht Club Resort Standard Room has a sliding glass door leading out to a small patio or balcony. There are cute blackout curtains on the window and door leading to the balcony. 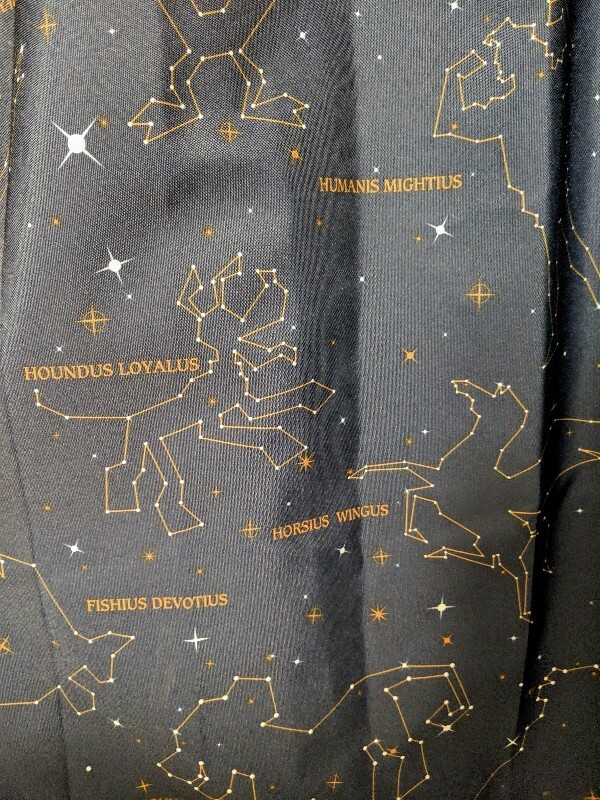 Look closely at the curtains to find fake constellations of some favorite Disney characters. Our balcony had a limited view of Stormalong Bay which was more than I expected from a standard room view. Disney’s website states that the view for a Yacht Club Resort Standard View room will be roof or parking areas. 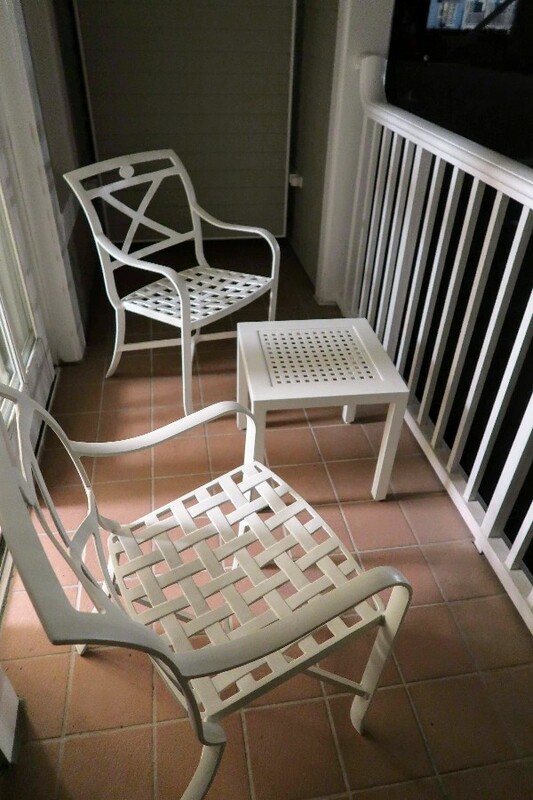 The Yacht Club balcony holds two chairs and a small side table. There is also a privacy wall on either side of the balcony. The bathroom is just inside the entryway to the side of the hallway. 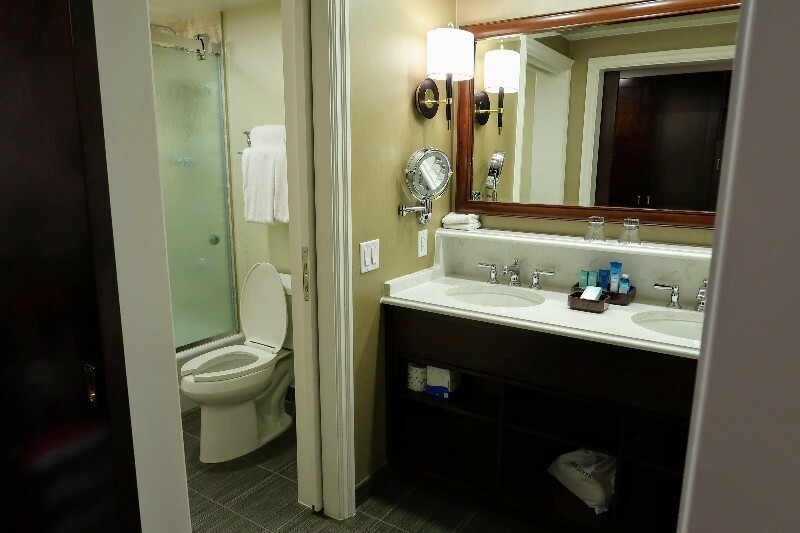 The bathroom has the split configuration that I really like with the sinks in one room and the shower/toilet in a small separate area. I was a little concerned that the door to the bathroom was a sliding barn door. Sometimes these doors do not close fully, but this one was great. In fact, the sliding door to the bathroom even has a soft-close feature so it can’t be accidentally slammed when closing. There are double sinks with storage in the vanity and a slender shelf above the sinks. The shower and toilet area is a bit tight, but manageable. A pocket door closes it off from the rest of the bathroom allowing multiple people to get ready at the same time. Disney’s Yacht Club Resort has complimentary wi-fi. The free wi-fi works pretty well overall, but does not always support streaming video from services like Netflix. 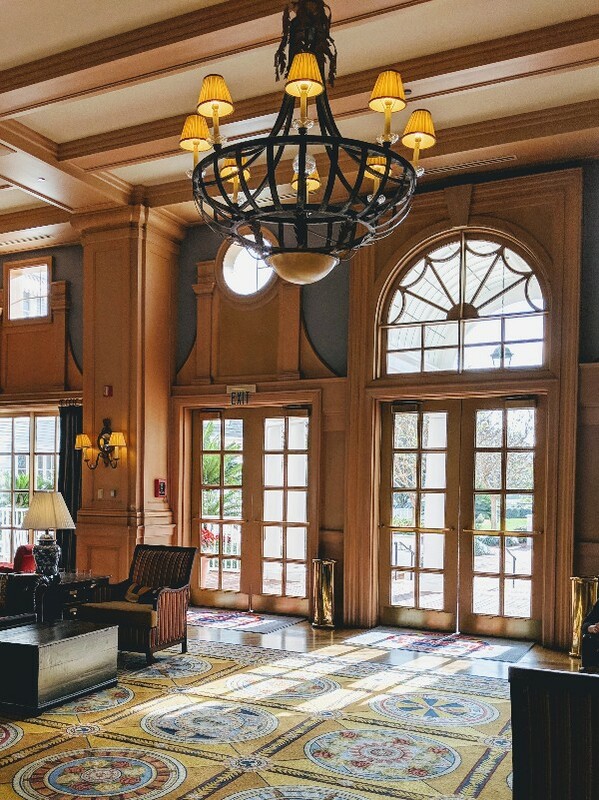 Disney’s Yacht Club Resort charges registered guest $24 per night for self-parking and $33 per night for valet parking. Disney’s Yacht Club Resort is located within walking distance of both Epcot and Hollywood Studios. The walk to Epcot takes you past Beach Club Resort and into the International Gateway entrance between France and United Kingdom in World Showcase. The walk to Hollywood Studios from Yacht Club is considerably longer, but is possible. If you prefer to save your steps for visiting the park take the boat from the dock located behind Yacht Club. This boat will bring you to Hollywood Studios with some stops at other resorts along the way. Bus transportation brings you to Magic Kingdom or Animal Kingdom from Disney’s Yacht Club Resort. The bus stop is located to the left side of the main entrance when you exit the lobby area. This article can help you learn more about the vast transportation system at Disney World. Disney’s Yacht Club Resort is a beautiful deluxe resort with great restaurant options and the best pool at Disney World. We love the sophisticated take on nautical design in the resort and the easy walk to Disney’s Beach Club, Disney’s Boardwalk, and Epcot. I was overall very happy with our room. The laminate floors, beautiful closet, split bathroom, and comfortable beds made for a pleasant stay at Yacht Club. My only real disappointment in our Yacht Club Standard Room was the small seeming mini-fridge. However, this minor inconvenience would not stop me from booking another stay at Yacht Club. Just make sure if you stay at Disney’s Yacht Club Resort you get an ice cream sandwich from Beaches and Cream for me! Find out more about planning a Disney World vacation here. Your review is great! Detailed and accurate! I have stayed at both the Beach Club and Yacht Club and while the Beach Club is my favorite for decor, my overall favorite is the Yacht Club. 1. They are first to get dropped off and picked up before Beach Club if you are using Disney transit. 2. The Ale and Compass restaurant there is my favorite nice sit down at Disney World. The food is just great. Amazing service without the sticker shock of the Yachtsman steak house. 3. While the walk To Epcot is a little bit longer, you are also a little bit closer to the boardwalk and the boat dock to Hollywood studios. 4. For whatever reason when we were there the lobby and fast serve seemed to be less crowded than the Beach Club. 5. And also possibly a fluke, but our room was cheaper than going with Beach Club, but you have all the same amenities. Thank you for the positive feedback and I love the information that you shared! You make a good point regarding transportation, being the first pick up and drop off is certainly a plus. It is funny how much variation in rates can be seen among Beach Club and Yacht Club. Sometimes you can save quite a bit by choosing one over the other even though they are sister resorts with shared amenities. I love the balcony – always a great addition to any hotel room – in my opinion! Now that I am an agent, and starting to price out disney, I need all these posts to help me navigate! Such great details and photos! There are so many disney resorts its hard to decide!